2019 Tesla graduates. Instructor Luke Thompson, left. 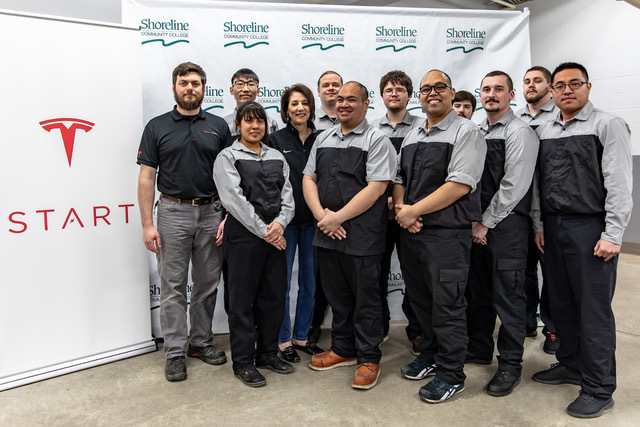 On Wednesday, March 27, 2019, Shoreline Community College graduated its second class of service technicians for the electric vehicle manufacturer Tesla. The class is a collaboration between the college and Tesla, which provides vehicles, tools, and instruction materials - and hires the graduates at service centers across North America. It's a new approach to vocational job training. Instead of sending students through a generalized class, this course trains specifically for Tesla. The college has three other highly successful automotive programs each specializing in a specific make of vehicle. And what is the advantage for Tesla? 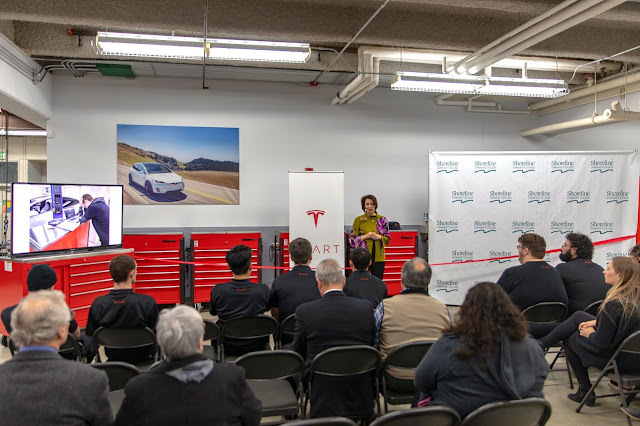 “Tesla is working with some of the best automotive education programs in the country — like Shoreline Community College — to educate students on electric vehicle technology and our unique approach to customer service to prepare them for a career at Tesla. 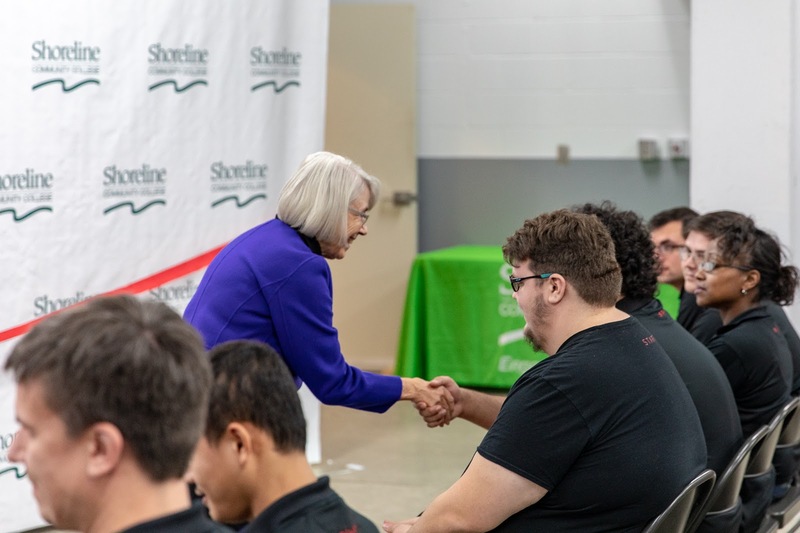 "Shoreline Community College is one of the North West’s top automotive tech schools and offers a wide range of different automotive manufacturing programs. "Students graduate with a full time job, certification and the skills necessary to succeed in the growing electric vehicle industry." Last year's inaugural class of 10 students, also under instructor Luke Thompson, completed an intensive 12-week training and were quickly employed by Tesla service centers. About half of them found employment in the Puget Sound area and the rest went to dealerships in other states. at the 2018 graduation and ribbon cutting. Graduates sit in the front row. 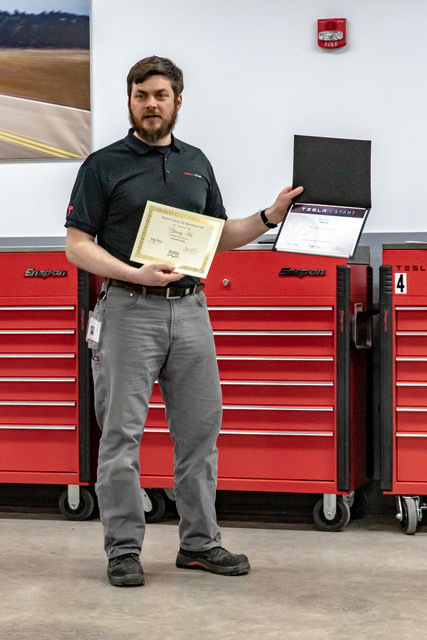 This year Shoreline CC graduated a new class of ten students, all with Tesla certifications.